$547 Early Bird until Dec 20. Calling all yoga teachers of all styles who are interested in taking their teaching to the next level. Are you looking for a way to make your classes more authentic and resonant? 3. end with a backbend, check. I believe in sequencing classes to resonate with my students well after we say “namaste”. 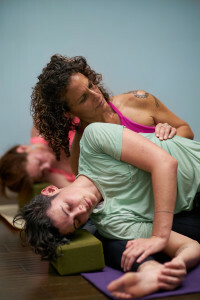 There are literally more than a billion different pose combinations to choose from, so let me encourage you to open up your teaching practice, and to work effectively with different injuries and abilities. It will make your teaching so much more satisfying for both you and your students. I am in love with the art and science of Hatha Yoga, and I love teaching teachers – it’s when I’m at my best. Time seems to stop, I’m completely focused and present. It’s really such a great feeling. There is a huge difference between working in an intensive format with someone over a period of time. We get to go deeper and create magic together. Just look at this beautiful photo of me working an intimate assist with a recent teacher training graduate. There is magic in the combined flow of our energies, I want everyone who teaches to be able to offer this kind of unconditional love to their students if they so desire. It’s an incredible gift for both the teacher and the student. Maybe it’s been a long time since you completed your 200 HR training, or maybe you aren’t teaching regularly. Maybe you teach all the time and are starting to feel burned out. This little mini-mentorship is for you. You will teach and receive feedback, you’ll get three exciting longer classes with me in addition to clinics on fun topics like working with energy, making skillful hands-on assists and so much more. Get fresh inspiration for your practice and teaching. Content includes Working with Injuries, Deeper Backbends, and Arm Balances/Inversions. Saturdays January 13, February 17 and March 10. Study the art and science of sequencing asanas and crafting entire classes. Learn to include variations for different levels of students as well as modifications for injuries. Hone your skill at working with different intentions and thrilling apex poses that help your students grow and deepen internally as well as physically. Learn to observe, appreciate, and feel what is happening with different students in each asana so you can truly See your students and address their individual needs. Develop your skillfulness in working individually with your students and giving appropriate verbal cues and hands-on assists, and using props so you can support your students in more meaningful ways in your mixed level classes. Each practice teaching session includes extensive and supportive feedback as well as discussion of teaching techniques and methods. Learn to feed your soul through authentic teaching presence and honest care of your students. Continuing Education Credits: This Teacher’s Intensive will provide you with 35 hours of continuing ed. credits with Yoga Alliance, fulfilling the requirement of 30-hours per three years to sustain your credential. These intensive weekends will be filled with my best stuff, I’m so excited to bring it to you!